While there are numerous works on the role of Muslim women in jurisprudence (fiqh) and literature, there are also studies on Muslim women in education and in medicine - although on a much smaller scale -, few sources mention the role of Muslim women in the development of science, technology and governance. There are isolated references that mention some of the famous women who had a role in advancing science and who established charitable, educational and religious institutions. Some examples include Zubayda who pioneered a most ambitious project of digging wells and building service stations all along the pilgrimage route from Baghdad to Mecca, Sutayta who was a mathematician and an expert witness in courts, Dhayfa Khatun who excelled in management and statesmanship, Fatima al-Fihriyya who founded the Qarawiyin mosque and university in Fez, along with the astrolabe maker Al-'Ijliya. This is not to mention the rulers and Queens such as Sitt al-Mulk, Shajarat al-Durr, Raziya of Delhi, and Amina of Zaria. In view of the growing importance of the subject of gender and women in society, this report presents what is currently known about some famous Muslim women, in the hope of initiating debate and starting the process of unearthing what could be a most significant find. In scholarship, there are isolated and scattered references to the famous women who had a role in advancing science and who established charitable, educational and religious institutions. Some examples include Zubayda bint Ja'far al-Mansur who pioneered a most ambitious project of digging wells and building service stations all along the pilgrimage route from Baghdad to Mecca, Sutayta who was a mathematician and an expert witness in the courts, Dhayfa Khatun who excelled in management and statesmanship, Fatima al-Fihriyya who founded the Qarawiyin mosque in Fez, Morocco, which is said to be the first university in the world, and the engineer Al-'Ijlia who made astrolabes in Aleppo. Figure 1: A famous signed sketch of Hypatia, included as an insert in Elbert Hubbard's pamphlet Little Journeys to the Homes of Great Teachers, vol. 23, no 4, 1908. Over thousands of years, many women have left a mark on their societies, changing the course of history and influencing significant spheres of life. Since ancient times, women have excelled in the areas of poetry, literature, medicine, philosophy and mathematics. A famous example is Hypatia (ca. 370-415), a philosopher, mathematician, astronomer, and teacher who lived in Alexandria, in Hellenistic Egypt, and who participated in that city's educational community . In contrast, we find little information on Muslim women's contributions in the classical books of history. New light might arise from the study of not yet edited manuscripts. There are around 5 million manuscripts in archives around the world. Only about 50,000 of them are edited and most of these are not about science . This points to the challenging task lying ahead for researchers into the subject. For several years, Dr Mohammed Akram Nadwi conducted a long term and large scale project to unearth the biographies of thousands of women who participated in the hadith tradition throughout Islamic history. In Al-Muhaddithat: The Women Scholars in Islam , Dr Nadwi summarised his 40-volume biographical dictionary (in Arabic) of the Muslim women who studied and taught hadith. Even in this short text, he demonstrates the central role women had in preserving the Prophet's teaching, which remains the master-guide to understanding the Qur'an as rules and norms for life. Within the bounds of their religion, women routinely attended and gave classes in the major mosques and madrasas, travelled intensively for ‘knowledge', transmitted and critiqued hadith, issued fatwas (rulings), and so on. Some of the most renowned male scholars have depended on, and praised, the scholarship of their female teachers. The women scholars enjoyed considerable public authority in society, not as the exception, but as the norm. The huge body of information reviewed in Al-Muhaddithat is essential to understanding the role of women in Islamic society, their past achievements and future potential. Hitherto it has been so dispersed as to be ‘hidden'. The information in Dr Nadwi's dictionary will greatly facilitate further study, contextualisation and analysis . Figure 3: From an adjacent room, women attend the preaching of Shaykh Baha'al-Din Veled in Balkh, Afghanistan. 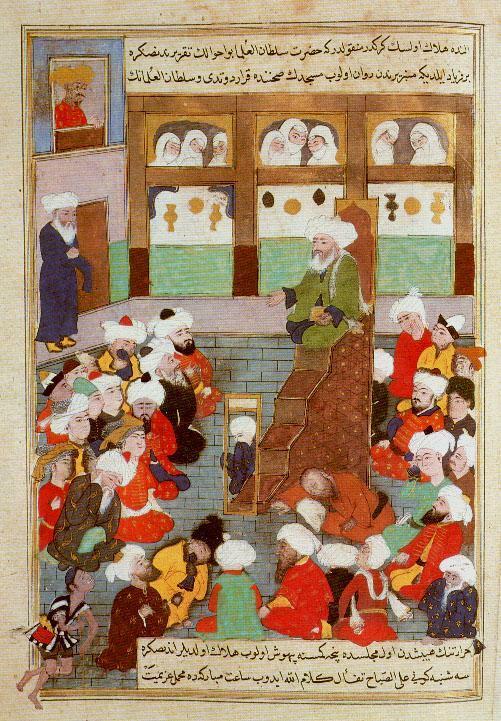 Miniature in Jami' al-Siyar, 1600. MS Hazine 1230, folio 112a, Topkapi Saray Museum, Istanbul. (Source). The entries are compiled from a number of sources. Many of the biographical collections devote a section to women, like volume eight of the Tabaqat of Ibn Sa'd and al-Sakhawi's Kitab an-Nisa'. Sometimes references are found within biographies of other references. A number of notable scholars mention their teachers, who included a number of women. Ibn Hajar studied with 53 women, as-Sakhawi had ijazas from 68 women, and as-Suyuti studied with 33 women – a quarter of his shaykhs. Al-Aghani by Abu'l-Faraj al-Isbahani is the major source for singers. An excellent modern source is A'lam an-Nisa' by ‘Umar Rida Kahhala, which consists of five volumes dealing with notable women, and is by no means inclusive" . Figure 5: Anonymous oil painting portrait, now located at Topkapi Palace in Istanbul, of Hürrem Sultan or Roxelana (c. 1510 - April 18, 1558), the wife of Süleyman the Magnificent, known for her charities and engagement in several major works of public building, from Mecca to Jerusalem and in Istanbul. (Source). The making of astrolabes, a branch of applied science of great status, was practiced by Al-'Ijliyah bint al-'Ijli al-Asturlabi, who followed her father's profession in Aleppo and was employed at the court of Sayf al-Dawlah (333 H/944 CE-357/967), one of the powerful Hamdanid rulers in northern Syria who guarded the frontier with the Byzantine empire in the tenth century CE. In the development of the art of calligraphy, one woman at least took part. Thana' was a slave in the household of the tutor to one of the Abbasid Caliph Al-Mansur's sons. This tutor, Ibn Qayyuma, seems to have been a dedicated teacher, for the young slaves in his household benefited as well as his royal pupil. Of the two whom he sent to be trained by the leading calligraphist of the day, Ishaq ibn Hammad, one was the girl Thana'. His pupils, says Ibn al-Nadim, "wrote the original measured scripts never since equaled ." Figure 6: Two Andalusian Arab women playing chess, with a girl playing lute (Chess Problem #19, F18R) , from Alphonso X's Book of Games (Libro de los Juegos). The book was commissioned between 1251 and 1282 CE by Alphonso X, King of Leon and Castile. It reflects the presence of the Islamic legacy in Christian Spain. It is now housed at the monastery library of St. Lorenze del Escorial. (Source). The companion Al-Shifa bint Abduallah al-Qurashiyah al-'Adawiyah had a strong presence in early Muslim history as she was one of the wise women of that time. She was literate at a time of illiteracy. She was involved in public administration and skilled in medicine. Her real name was Laila, however "al-Shifa", which means "the healing", is partly derived from her profession as a nurse and medical practitioner. Al-Shifa used to use a preventative treatment against ant bites and the Prophet approved of her method and requested her to train other Muslim women . In the field of mathematics, names of female scholars featured in Islamic history such as Amat-Al-Wahid Sutaita Al-Mahamli from Baghdad and Labana of Cordoba, both from the 10th century. Systematic investigation, with the methodology of history of science, will certainly yield more information on other women scholars who practiced mathematics in Islamic history. We know of many women who practiced fiqh (Islamic jurisprudence). Now, calculations and arithmetic were intertwined with successoral calculations (fara'idh and mawarith), a branch of applied mathematics devoted to performing calculatations of inheritance according to the rules of Islamic law. Sutayta, who lived in the second half of the 10th century, came from an educated family from Baghdad. Her father was the judge Abu Abdallah al-Hussein, author of several books including Kitab fi al-fiqh, Salat al-'idayn . Her uncle was a Hadith scholar and her son was the judge Abu-Hussein Mohammed bin Ahmed bin Ismail al-Mahamli who was known for his judgements and his talents. Sutayta was taught and guided by several scholars including her father. Other scholars who taught her were Abu Hamza b. Qasim, Omar b. Abdul-'Aziz al-Hashimi, Ismail b. Al-Abbas al-Warraq and Abdul-Alghafir b. Salamah al-Homsi. Sutayta was known for her good reputation, morality and modesty. She was praised by historians such as Ibn al-Jawzi, Ibn al-Khatib Baghdadi and Ibn Kathīr . She died in the year 377H/987CE. Sutayta did not specialise in just one subject but excelled in many fields such as Arabic literature, hadith, and jurisprudence as well as mathematics. It is said that she was an expert in hisab (arithmetics) and fara'idh (successoral calculations), both being practical branches of mathematics which were well developed in her time. It is said also that she invented solutions to equations which have been cited by other mathematicians, these include equations which denote aptitude in algebra. Although these equations were few, they demonstrated that her skills in mathematics went beyond a simple aptitude to perform calculations. In section VII.2 (information on mathematicians, engineers, practitioners of arithmetic, musicians, calculators, astrologers, makers of instruments, machines, and automata), Ibn al-Nadim presents a list of 16 names of engineers, craftsmen and artisans of astronomical instruments and other machines. Al-'Ijliya, of whom Ibn al-Nadim did not mention the first name, is the only female in the list. Several of the experts thus named are from Harran, in Northern Mesopotamia, and probably Sabians, whilst others may be Christians, as it can be concluded from their names. At the end of the list, two entries mentioned Al-'Ijli al-Usturlabi, pupil of Betolus, "and his daughter Al-'Ijliya, who was with [meaning she worked in the court of] Sayf al-Dawla; she was the pupil of Bitolus" (Al-'Ijli al-Usturlabi ghulâm Bitolus; Al-'Ijliya ibnatuhu ma'a Sayf al-Dawla tilmidhat Bitolus) . The name of Al-'Ijli and his daughter is derived from Banu ‘Ijl, a tribe which was part of Banu Bakr, an Arabian tribe belonging to the large Rabi'ah branch of Adnanite tribes. Bakr's original lands were in Nejd, in central Arabia, but most of the tribe's bedouin sections migrated northwards immediately before Islam, and settled in the area of Al-Jazirah, on the upper Euphrates. The city of Diyarbakir in southern Turkey takes its name from this tribe. The Banu ‘Ijl, mostly Bedouin, located in al-Yamama and the southern borders of Mesopotamia . From this, albeit too brief, quotation of Ibn al-Nadim, it turns out that Al-'Ijliya, of whom Ibn al-Nadim did not specify the first name, was the daughter of an instrument maker, and like her father, they were members of a rich tradition of engineers and astronomical instrument makers who flourished in the 9th-10th century. Ibn al-Nadim mentioned her in a section on "machines" but in it on astronomical instruments only. Therefore, we do not know if Al-'Ijliya was solely expert in this field. She worked in the court of Sayf al-Dawla in Aleppo (reigned from 944 CE to 967 CE) and was the pupil of a certain Bitolus, who taught her the secrets of the profession. Her father, and several scholars mentioned by Ibn al-Nadim, were apprentices to the same master, who seems to have been a famous astrolabe-maker. We do not know where she was born nor if she learned instrument making in Aleppo or elsewhere. Among the few extant Islamic astrolabes, none bears her name, and as far as the available classical sources can allow us to judge, she is the only woman mentioned in connection with instrument making or engineering work. Zubayda bint Abu Ja'far, the wife of Harun ar-Rashid, was the wealthiest and most powerful woman in the world of her time. She was a noblewoman of great generosity and munificence. She developed many buildings in different cities. She was known to have embarked upon a gigantic project to build service stations with water wells all along the Pilgrimage route from Baghdad to Mecca. The famous Zubayda water spring in the outskirts of Mecca still carries her name. She was also a patron of the arts and poetry . Dhayfa Khatun, the powerful wife of the Ayyubid ruler of Aleppo al-Zahir Ghazi, was the Queen of Aleppo for six years. She was born in Aleppo in 1186 CE. Her father was King al-Adel, the brother of Salah al-Din Al-Ayyubi and her brother was King al-Kamel. She was married to King al-Zahir, the son of Salah al-Din. Her son was King Abdul-Aziz. After her son's death, she became the Queen of Aleppo as her grandson was only 7 years of age. During her 6-year rule, she faced threats from Mongols, Seljuks, Crusaders and Khuarzmein. 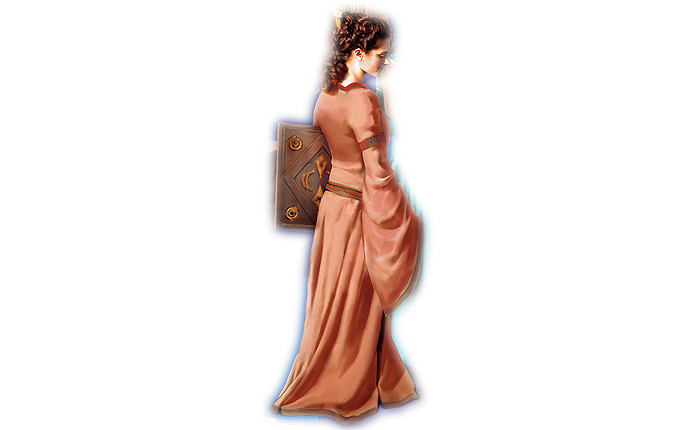 Dhayfa was a popular queen; she removed injustices and unfair taxes throughout Aleppo. She favored the poor and scientists and founded many charities to support them. Dhayfa was a prominent architectural patron. She established large endowments for the maintenance and operation of her charitable foundations . Figure 9: Front cover of Al-Muhaddithat: The Women Scholars in Islam by Shaykh Mohammad Akram Nadwi (Interface Publications, 2007). This book is an adaptation of the Muqaddimah or Preface to M. A. Nadwi's multi-volume biographical dictionary in Arabic of the Muslim women who studied and taught hadith. The huge body of information reviewed in Al-Muhaddithat is essential to understanding the role of women in Islamic society, their past achievements and future potential. In addition to her political and social roles, Dhayfa sponsored learning in Aleppo where she founded two schools. The first was al-Firdaous School which specialised in Islamic studies and Islamic law, specially the Shafi'i doctrine. Al-Firdaous School was located close to Bab al-Makam in Aleppo and had a teacher, an Imam and twenty scholars, according to the structure of the educational system at that time. Its campus consisted of several buildings, including the school, a residential hall for students and a mosque. The second school, the Khankah School, specialised in both Sharia and other fields. It was located in Mahalat al-Frafera. Dhayfa died in 1242 at the age 59 and was buried in the Aleppo citadel . Hürrem Sultan, also called Roxelana, was born in year 1500 to an Ukrainian father. She was enslaved during the Crimean Turks raids on Ukraine during the reign of Yavuz Sultan Selim, and presented to the Ottoman palace. She was the most beloved concubine of Süleyman the Magnificent and became his wife. During her lifetime, Hürrem Sultan was concerned with charitable works and founded a number of institutions. These include a mosque complex in Istanbul and the Haseki Külliye complex, which consists of a mosque, medrese, school and imaret (public kitchen). She also built çifte hamam (double bathhouse with sections for both men and women), two schools and a women's hospital. In addition to this, she also commissioned the building of four schools in Mecca and a mosque in Jerusalem. Hürrem Sultan died in April 1558 and lies buried in the graveyard of the Süleymaniye Mosque . On the other extremity of the Muslim world and almost in the same time as Shajarat al-Durr, another woman held power, but this time in India. Razia (or Raziyya) Sultana of Delhi took power in Delhi for four years (1236-1240 CE). She was the only woman ever to sit on the throne of Delhi. Razia's ancestors were Muslims of Turkish descent who came to India during the 11th century. Contrary to custom, her father selected her, over her brothers, to be his successor. After her father's death, she was persuaded to step down from the throne in favour of her stepbrother Ruknuddin, but, opposed to his rule, the people demanded that she become Sultana in 1236. Jealous of her attention to one of her advisors, Jamal Uddin Yaqut (not of Turkish blood), her governor, Altunia, rebelled. Razia's troops were defeated, Jamal was killed in battle, Razia was captured and married to her conqueror in 1240. One of her brothers claimed the throne for himself, Razia and her new husband were defeated in battle where both died . Figure 10: Front cover of Al-Mu'allifat min al-nisa' wa-mu'allataftuhunna fi al-tarikh al-islami by Muhammad Khayr Ramadhan Yusuf (Beirut: Dar Ibn Hazm, 1412 H). Firishta, a 16th-century historian of Muslim rule in India, wrote about her: "The Princess was adorned with every qualification required in the ablest kings and the strictest scrutinizers of her actions could find in her no fault, but that she was a woman. In the time of her father, she entered deeply into the affairs of government, which disposition he encouraged, finding she had a remarkable talent in politics. He once appointed her regent (the one in control) in his absence. When the emirs (military advisors) asked him why he appointed his daughter to such an office in preference to so many of his sons, he replied that he saw his sons giving themselves up to wine, women, gaming and the worship of the wind (flattery); that therefore he thought the government too weighty for their shoulders to bear and that Raziya, though a woman, had a man's head and heart and was better than twenty such sons ." She is credited with popularising the earthen city wall fortifications, which became characteristic of Hausa city-states since then. She ordered the building of a defensive wall around each military camp that she established. Later, towns grew within these protective walls, many of which are still in existence. They are known as "ganuwar Amina", or Amina's walls . Click here to view the previous page.